Want to protect your auditory organs? The percussive vibrations of each gunshot actually kill vital little hairs deep in your inner ear. And that can open the door to a high pitch ringing or humming noise that can last forever. 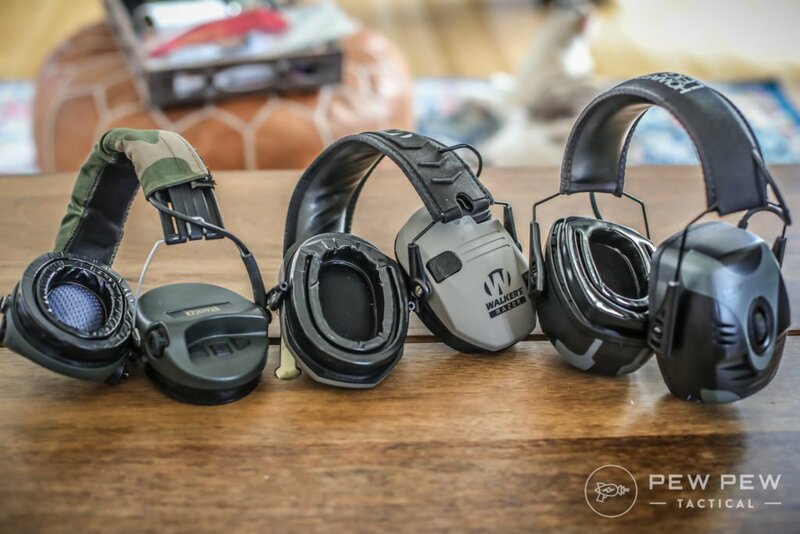 We’ve got the 411 on the best shooting ear protection…from affordable passive ones to the top of the line electronic earmuffs. We’ve tried them all over hundreds of hours at the range as shooters and range officers. We’ll quickly cover our top picks in each category and budget. Then round it out with our research and more in-depth info on each pick at the end. Ready? Let’s start with some passive ear protection. The most affordable of the bunch and really protective at 32dB NRR (noise reduction rating). Remember to compress them before sticking them into your ears. Big, affordable, and protective at 30 dB NRR. 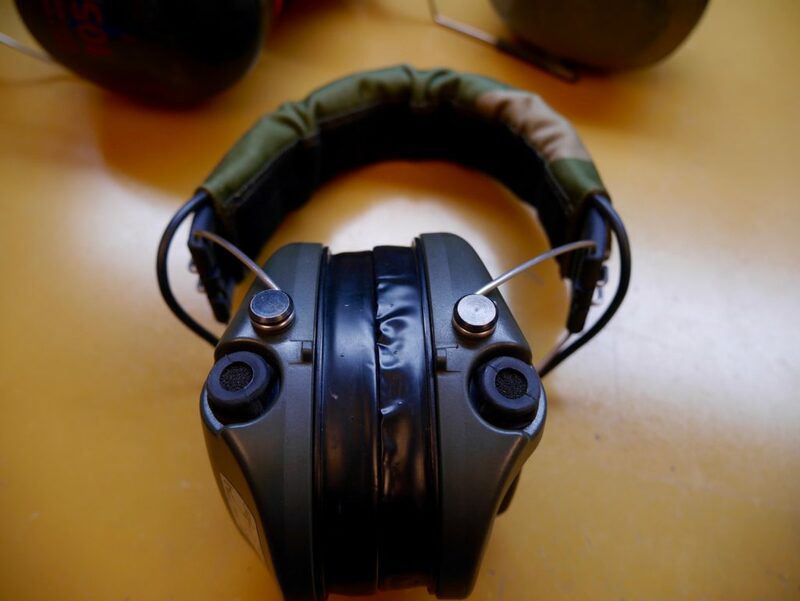 My first set of hearing protection earmuffs/headphones. Great if you don’t like things inside your ear. Slimmer profile for a good long-gun cheekweld and adequate protection at 24 dB NRR. What I used for many ears (sorry). Now, let’s dive into electronic ear protection that cuts out harmful shooting sounds but amplifies regular sounds like people talking. 14K reviews on Amazon with a 4.5 star average. It’s the first pair of electronic earmuffs people get when they are tired of yelling “WHAT?! ?” when someone speaks to them at the range. Affordable, decent protection at 22dB NRR, slim for rifle/shotgun shooting, and reasonably comfortable. Noisefighters Gel Caps…this upgrade makes the HL’s super comfortable. These feel like the pads used in my favorite $200+ earmuffs further down the list. AND they have cutouts for eye protection since after a few hours your glasses really dig into the side of your head. If you’re ready to jump up a notch you get 30 dB of protection and ability to hear people around you and range commands. Note that I would use these with pistol shooting only…they are pretty thick and will mess up your cheekweld. Plus…since they also fit the Noisefighters Gel Caps! For most you’ll be well-served with any of the Howard Leights with the possibility of upgrading to gel caps. But if you want better sound quality and shutoff (plus the ability to change it for each ear), I like Pro Ears’ Pro Tac Slim Gold with 28dB NRR. 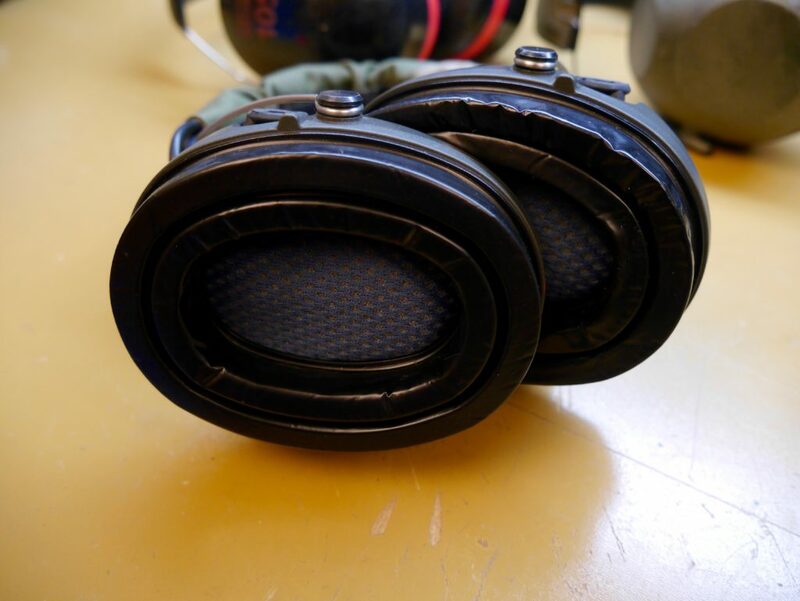 Most of my fellow competitors wear these bad boys for their comfort and sound quality. I finally caved after I became range officer for a couple competitions. That meant constant blasts for hours while still needing to hear everything. It’s ok protection at 22dB NRR which is fine for pistol competitions…but if you have compensated rifles going off around you…they have enough room in them for some lightly put-in earplugs. Well that’s the quick list of my favorites…check out our research and more in-depth reviews of each. Everyone always talks about the middle ear. That’s mainly the eardrum and those three little bones with cool names: the hammer, anvil, and stirrup. But what really causes hearing damage though is what happens in the inner ear. Inside, picture a spiral staircase. Only this passage is just 2 millimeters wide and maybe 30 millimeters long all coiled up. Sound races along the outside of the staircase, but in the middle are the organ of Corti (yup, sounds ominous) and the basilar membrane. Both are long and thin, with the organ resting on the membrane. All along this little assembly are tiny little hairs. They register sound and transmit it through the auditory nerve to your brain. But—and here’s the kicker—exposure to an intense sound—that’s 140 dB or more—can make segments of the organ of Corti separate from the basilar membrane. Portions of it actually tear away and float around. Sounds you hear all the time can have a huge effect your hearing. So you end up with an inflamed lesion that causes an accompanying chemical reaction. Hairs die. Scar tissue forms, and even with rest, the tiny hairs typically continue to degenerate. A cascade effect takes over, and the entire auditory central nervous system goes deaf. One more thing: noise exposure is cumulative. Each loud sound is killing ear hairs, so you need to be thinking about total exposure over the course of days, weeks and years. Ready for some hearing protection yet? First of all, forget cotton balls, tissue, packing peanuts, or my personal old-shooter favorite, cigarette filters. While they are better than nothing, they are also next to nothing. At best, you’ll get a reduction of maybe 7dB. some techy alternatives with sound-circuit technology. There are so many options, there’s no reason not to protect your ear hairs. From neon foam-on-strings to high-tech headphones, there’s something for everyone. What you should be looking for is a minimum noise reduction of 15dB, but 30dB is preferable. Pair a good set of plugs with muffs and you might shut out another 10 to 15dB or so. You know the load you like to shoot, but a conservative 140dB is a common figure for an average muzzle blast. A .22 will be less, a magnum more. With quality protection, you can start approaching a range that’s still loud—as in chainsaw- or sandblast-loud—but may be up to 1,000 times quieter. Traditional earplugs fit inside the ear, forming a seal that blocks sound. They come in a range of sizes, configurations and materials—from foam to hypoallergenic rubber and moldable polymers. Earplugs tend to be more efficient at handling low-frequency noise. Disposables available in bulk at pennies per pair. Some rated 30dB or better. Some models moldable for custom fit. Good for tight spaces; no snagging. Fit constraints for narrow or wide ear canals. Muffles all sound indiscriminately; works too well. Foam models require proper roll-down insertion, removal and reuse. Some models difficult to pair with muffs. Moldables more expensive; may be difficult to alter. Fumble-and-loss factor in dirty environments. I like these because they are comfortable for a few hours and are 32dB NRR rated. There’s tons of other foam options but I would stay away from cylindrical ones…those are not very comfy. Traditional earmuffs come on a headband and have foam pads that cover and form a seal around the entire ear. For those who don’t like the over-the-head fit, a few versions have back-of-the-head wrap designs. Muffs typically are better at screening out higher frequency sounds. Convenient to put on and take off repeatedly. One size usually fits all. May snag or bump in confined spaces. Comfort issues, especially in humidity, hot or wet weather. Can interfere with proper cheek weld. Issues with safety or prescription glasses and proper ear seal. May not provide as much noise reduction as earplugs; can require pairing with plugs. Hats or long hair, anyone? My favorites and what I wore for a long time are the 3M Optime model and Shotgunner model. The Optime is super protective with 30dB NRR but is also quite bulky. It’s not heavy but it will seriously cramp on your cheekweld situation for rifles and shotguns. Use if you’re shooting handguns…and especially if you’re at an indoor range where the sound reverberates. For going slim…I really like the Shotgunner. I painted mine over and it served me well for years. It’s less protection at 24dB but you can always double up if it gets really loud with compensated rifles. Comfort is average but I found it to be fine for a few hours if I can take it off my ears during downtime. High-tech electronics are stepping up the game for earplugs, ear cuffs, ear muffs, and every smart device in between. These focus on screening out the loud booms while letting you still hear conversations and the sounds of the great outdoors. Noise filtering; loud noises muffled but conversation and subtle noises amplified. Lots of options, including Bluetooth to enable smartphones. Variety of formats—muffs, earplugs, semis and cuffs. Price point—usually $50 and up, up, up. Expensive to lose; fallen electronic cuffs and earplugs hard to find in the field. Some models are bulky, heavy. My go-to recommendation is the Howard Leight Impact Sports. They are super popular for a reason. They are affordable and they work. The only thing I could knock them for was their comfort. But with the newly released gel caps…I have nothing bad to say anymore. These usually go head to head against Walker’s Razor Slim. But I give the win to Howard Leight because it’s usually cheaper and are super comfortable with the gel cap upgrades. I’d say get the Howard Leight’s if you want to experience electronic ear protection. See how you feel after a few hours at the range. And you’ll always have the option of having sweet gel on your ears down the line. If you want to step up a little in the world of electronic earmuffs…there’s the Impact Sports Pro which offers 30db NRR protection and good sound cutoff. They are large, bulky, but surprisingly light and comfy to wear even for longer range sessions and provide amazing noise reduction. I’d recommend these if you are shooting large caliber handguns or shoot at an indoor range. And they fit the Noisefighters Gel Caps. Next up is a bigger jump in price. But with that you get much better cutoff and amplification. Pro Ears has a stellar reputation and I like their Pro Tac Slim Gold edition. They don’t make my Editor’s Pick because they fit a little tight for people and the ears aren’t as comfy as the MSA Sordins. Ah…the MSA Sordins Supreme Pro X. A mouthful to say…but like a heavenly cloud on your ears. I simply asked my competition buddies “what are the best electronic ear muffs” and the MSA’s got the majority of votes. They are comfy for hours with their gel caps, have easily accessible button controls, great sound cutoff and compression, and allow for earplugs if the decent 22db NRR doesn’t cut it. Plus they can attach to ballistic helmets and comms if that’s your thing. What I wear when I shoot for hours and my main recommendation for when people want the best. How did we do? Did you get the Howard Leights or MSA Sordins? Let us know down below. And for our other favorite hands-on-tested guns & gear…check out Editor’s Picks. The post Best Shooting Ear Protection [Electronic & Passive] appeared first on Pew Pew Tactical.